Wild turbulence on the ground. 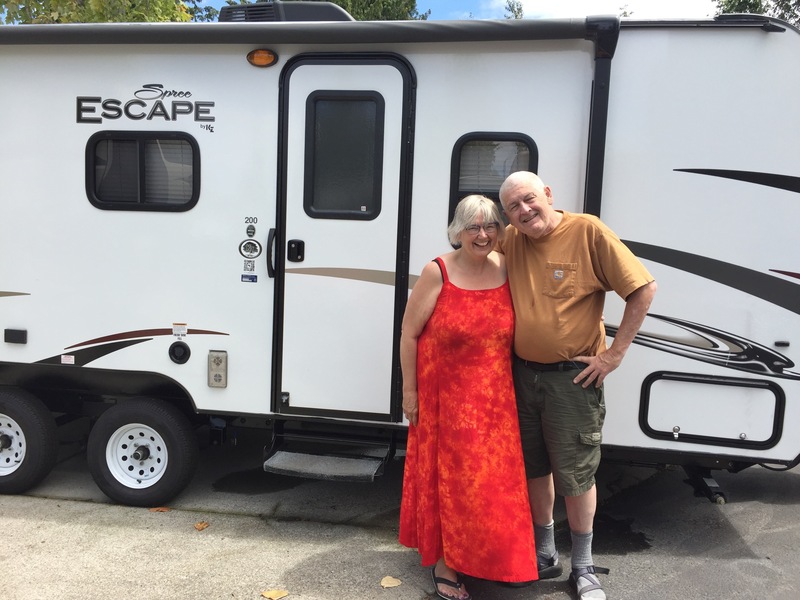 Our 21-foot travel trailer rocks and jolts for hours as the wind roars in from the Pacific Ocean, on whose edge we are parked. Heavy pelting rain slams hard against the window. It is dark outside on the first day of Advent – a time when new things come to birth. Our candle, lit at dinner, is left burning as if to hold space amid the chaotic power swirling around us. I have felt this kind of power before. Years ago, I was giving birth to my son when primal sounds coursed through me and out into the labor room. A doctor opened the door to ask the midwife if everything was okay. Later, someone said I was screaming, but that was not my experience. I was simply giving voice to something from beyond my reality that was creating a miracle – a new life. I did not feel in pain. I felt in power. I return inside with no answer. Soon the wind calms, the rain stops and my tensed-up shoulders drop a bit. Just as I get comfortable, the storm becomes fierce again with increased intensity. This is not an ordinary storm; these are not ordinary times in our country. Are we in pain or are we in power? I’m discomfited that I’m no longer so sure of what exactly needs to be birthed in the world. All my reasoned ideas seem to collide or float insecurely, unsure of where to land. The election and its aftermath continue to feel like a battering storm that will not pass. Foundations of decency and integrity I thought deeply rooted in our country’s values are being dug up and tossed aside by hate and greed. More time passes and still the storm rages. It’s bedtime, but how can I let go into sleep when I know not what else this storm will bring? I feel an urgent call to vigilance; to keep watch. To listen intently for sounds new to me. To see clearly what the wind may dislodge from stuck places. I am aware that these valid reasons can also be bolstering my illusion of control. Yet, surrender does not seem the best choice in these times. I have not yet met inside myself a place between control and surrender that has integrity. Which is not to say it doesn’t exist. I’m just not sure how to find it. “How will you go about finding that thing the nature of which is totally unknown to you?” is a phrase from Plato that author Rebecca Solnit shares in her book, The Field Guide to Getting Lost. The suggested answer is to get lost; to enter places of uncertainty, doubt, and mystery and you may find another way of proceeding. It’s letting the winds blow you to unfamiliar places, and perhaps, to unfamiliar people. We were unfamiliar with our campground host at this RV park when we arrived. I had knocked on his trailer door when we first arrived and found our assigned spot covered in water. John was very solicitous and friendly, guiding us to a drier spot and stopping by frequently just to say hello and share camping stories. I wanted to like him. The “Make America Great Again” sign on his truck kept me wary. An accessible parking permit hung from the rear-view mirror. I noticed he never traveled anywhere without his small dog. His disability is not visible to me. He does not know how I shudder when I see his Trump sign. We’re leaving tomorrow and I’ve yet to have the more extended conversation that I wanted with John. Nevertheless, I am unable to make him as one-dimensional as I might want to do, which is a good thing. None of us are one-dimensional. Wandering around in the unknown dimensions means embracing discomfort. It means risking a crack in the walls we’ve erected to protect ourselves where we feel most vulnerable. In All the Light We Cannot See, a Pulitzer prize story by Anthony Doerr set in WWII, there are reminders of the goodness of people and their courageous acts even in the midst of inhumane horrors. Light travels at speeds and distances that are invisible to our understanding. These wild winds we’re experiencing will open cracks that need widening and bear light forth at unimagined speeds.. We can meet the chaos which is birthing something new. We can embrace the power inherent in a complex labor. Even as we feel lost, we will resist that which would aim to still these winds of change. This is not a solitary process. It is one of solidarity. Let us take each other’s hands and walk boldly into the wind. ← We’re back in Seattle! I like the way you write!